Having trouble hearing the sound coming from the speaker of your iPad 2, even at full volume? You’re not the only one. A number of reviewers and end users have cited volume level as a concern in their Apple iPad 2 reviews. 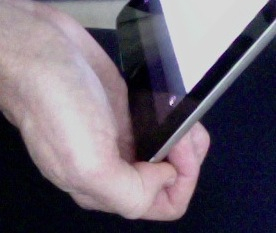 The beveled edge of iPad 2 means some of the sound from the speaker ends up behind the iPad, firing down and away from the listener. You can easily redirect some of that lost sound and improve the volume by cupping your hand beneath the speaker. Cup your hand under the lower right corner of your iPad. You’ll notice the difference. Finding it tiring to cup your hand for long periods of listening? Then you may want to check out a new product called the SoundJaw, a plastic clip that mounts over the speaker port. Here’s a review from Steven Sande of TUAW (The Unofficial Apple Weblog). Of course, you can always use earbuds or headphones when listening alone, or an amplified speaker when sharing with friends or family. But for a quick and convenient boost of audio output, just cup your hand.